Ferrari's 'Testarossa' was released in 1984. Testarossa is Italian for 'redhead'. That was in reference to the red cylinder head of the car's 5.0-litre flat-12 engine. Beneath the head were four valves per 'pot' ... heat-protected by state-of-the-art nickel-alloy. This was a wise move on Ferrari's part - since there was every likelihood of some temperature build-up! In so doing, not only had Ferrari improved the engine's tractability - but its power output had soared to 390bhp! The nickel-alloy valves were great - but, more needed to be done to dissipate heat. Ferrari's engineers had done their bit ... now it was up to the stylists! The Testarossa was mid-engined - helping the handling. Cooling was moved to the rear. The new Ferrari's design brief had shifted ... literally! Enter Pininfarina - to oversee the modifications. They drew a low, wide back-end - leaving lots of room for cooling components. The side-mounted air-ducts are pure Testarossa. Stretching from the doors to the rear wings, they are the car's 'trademark'. Rarely has cooling been so ... cool! But the Testarossa did not just turn heads. Technically, too, it delivered. Top speed was 180mph - 0-60 arriving in 5.5secs. Steering was superb - the smallest of inputs transmitted. So, the Testarossa was nimble - as well as being blisteringly quick! As supercars go, the Testarossa was the complete package. And it was a light package, too. The bodywork was aluminium - apart from the roof and doors. Wind tunnel tests sorted aerodynamics - and down-force. But, there is always room for improvement! To that end, two more versions of the Testarossa were built. In 1992, it was the turn of the 512 TR. The fastest production car in the world at the time, it knocked Lamborghini's 'Diablo' off the top spot. 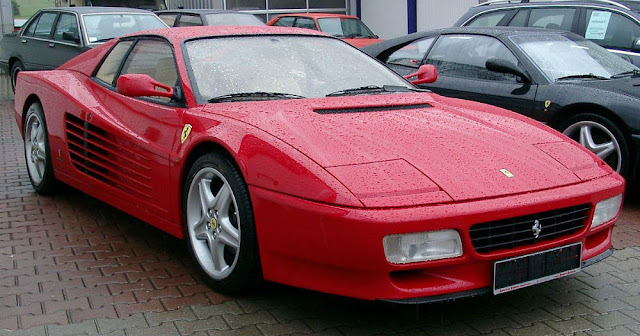 Then, in 1994, came the F512M. The Testarossa was now a true 200mph supercar. 'Redheads' are reputed to be a tad on the fiery side ... and the Ferrari Testarossa did absolutely nothing to dispel that stereotype!